Futurebiotics has designed an all-natural formula called VeinFactors which is said to help maintain blood vessel tone and promote healthy circulation in the legs. 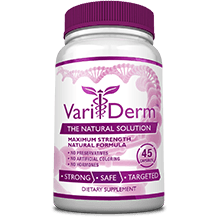 This formula claims to contain clinically proven ingredients, traditional compounds and natural co-factors that effectively help with venous disorders such as varicose veins. Our review of Futurebiotics VeinFactors aims to help provide consumers with all the relevant information about this product. Diosmin and Hesperidin are naturally-occurring flavonoids that have been shown to help promote blood vessel tone and support healthy circulation. Horse Chestnut seed and Butcher’s broom helps to reduce swelling, cramps, water retention and pain while improving circulation. Gotu Kola helps to regulate blood pressure and may be beneficial for circulation. The probiotic and Digezyme ingredients help to restore the body’s natural flora and assists with absorption and digestion. It is disappointing to see that this product contains additional fillers which are known to compromise the quality and potency of the active ingredients. Futurebiotics recommends taking 3 capsules daily for optimum results. These capsules should be taken with meals. While there are no known side effects associated with this product, you should always consult your doctor first if you are taking any medication or have any known medical condition. This product should not be used if you are pregnant or breastfeeding. Each bottle of VeinFactors contains 90 capsules and retails for $29.95 online. This product can be purchased directly from the manufacturer or from third-party distributors. We were unable to find any discount deals for this product. Fortunately, Futurebiotics has a satisfaction guarantee in place for consumers that allows you to request a refund within 365 days. This applies to bottles that have already been opened and used provided that you return the unused portion back to the manufacturer. The positive points to note about this product is that there is a sufficient guarantee and that this formula stays true to its word about using all-natural ingredients. The downsides of this product are that there are various additional fillers which may compromise the effectiveness of this product. Another downside is that we were unable to find any sufficient proof from end users that this product was effective. We were only able to find a very few positive comments but unfortunately, it is not enough to provide any factual proof that this product does, in fact, work for the majority of users.